I love hummus. It’s delicious, nutritious, and super easy to make. It’s also 100% vegan if that is something that matters for you. Hummus, like salsa, is a template. You can add whatever you want to spice it up in different ways. I love mine super heavy on garlic and olives with hints of a half dozen other spices. 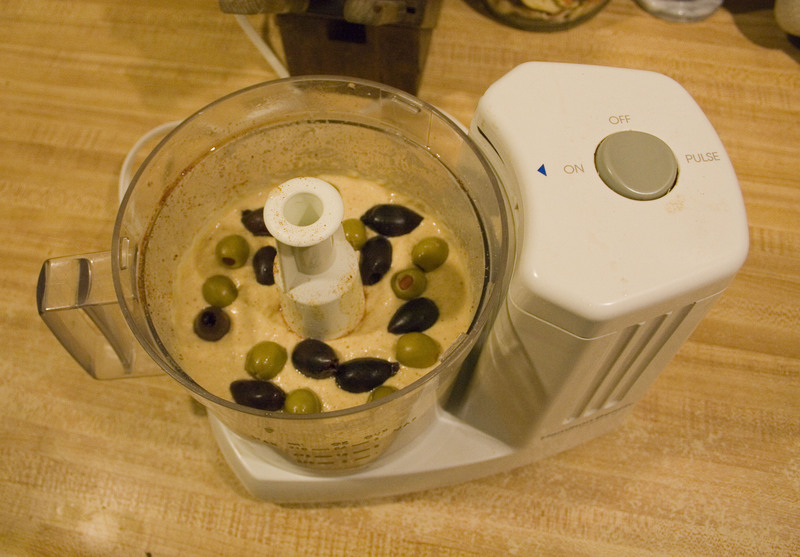 While I did say hummus is easy to make it comes with a major caveat, without a food processor you might as well not even try. I have never tried it without my food processor with success. 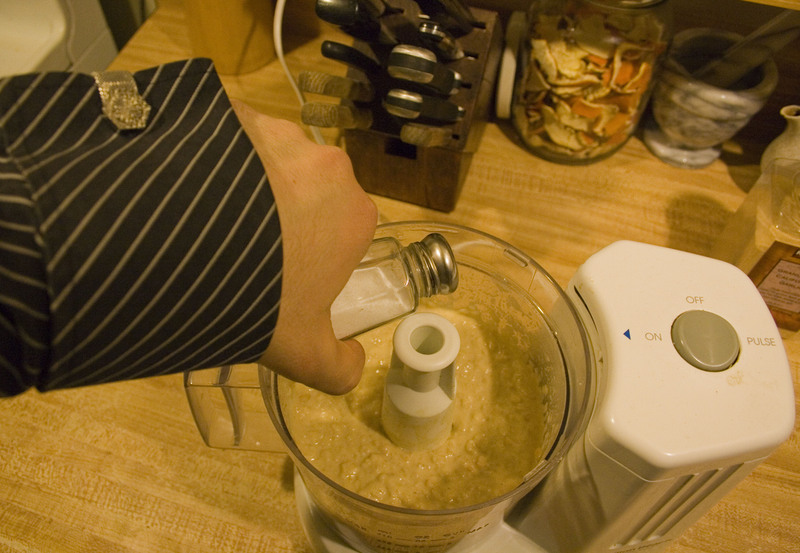 I once tried in a blender but it was not successful (could have just been the blender though). I hope you enjoy my first cooking post. These are old photos that I took before a fire trashed my old house and I was forced to move. All future postings will feature my new kitchen which doesn’t have my beer collection in it (yet). 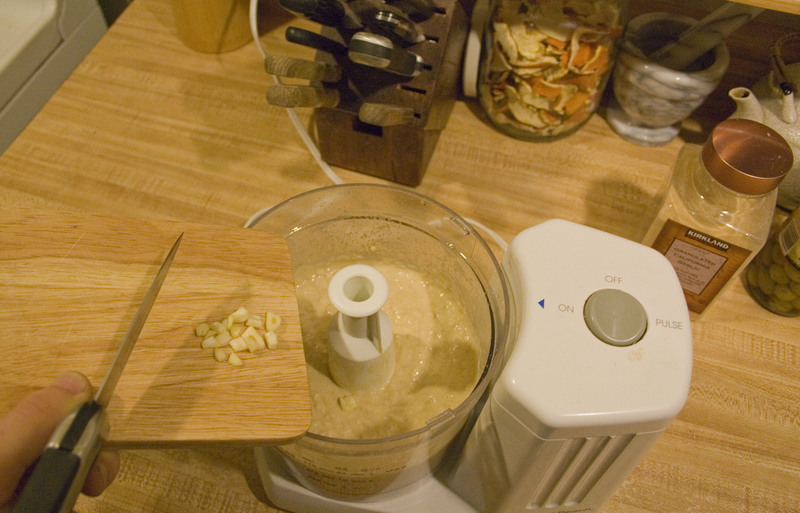 You Will Need: Garbanzo beans, tahini sauce (I used a combo of two tahini’s for this hummus), Salt, Lemon Juice, and Garlic….everything else is optional (yes, even olive oil). Normally olive oil is viewed as a component part of hummus, I’ve made multiple batches without it and there is virtually no difference. I prefer it with olive oil myself though, mostly for the good saturated fats found in olive oil. 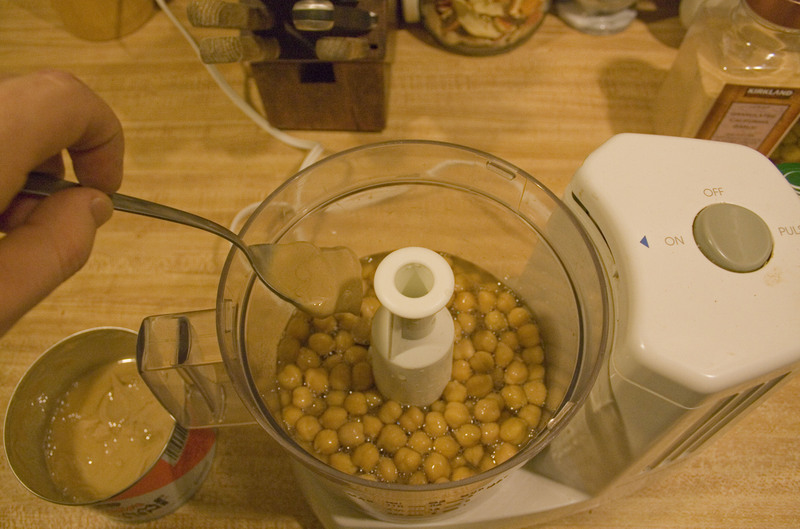 Step One: Pour the garbanzo beans into the food processor, including the liquid the beans were soaking in (whether canned or fresh). 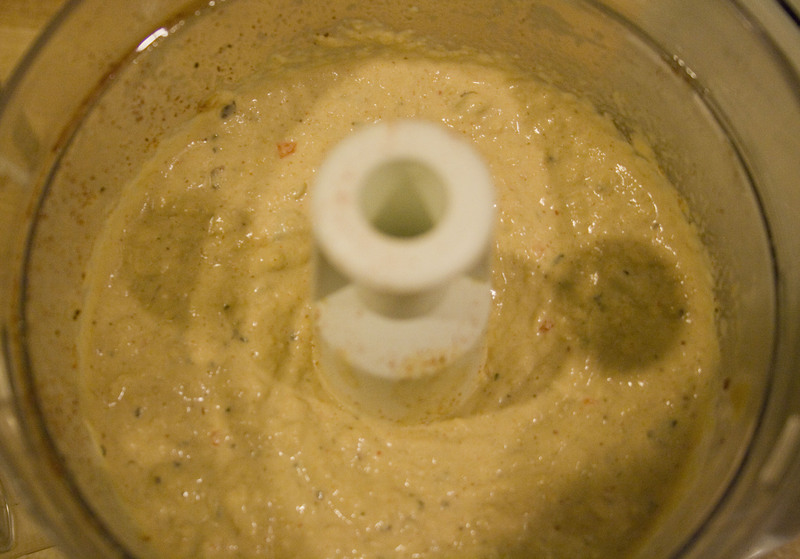 Add tahini to taste, I usually add about two heaping tablespoons. Blend until it has a homogeneous consistency. Step 2: Add your salt, about a teaspoon or so, to taste. 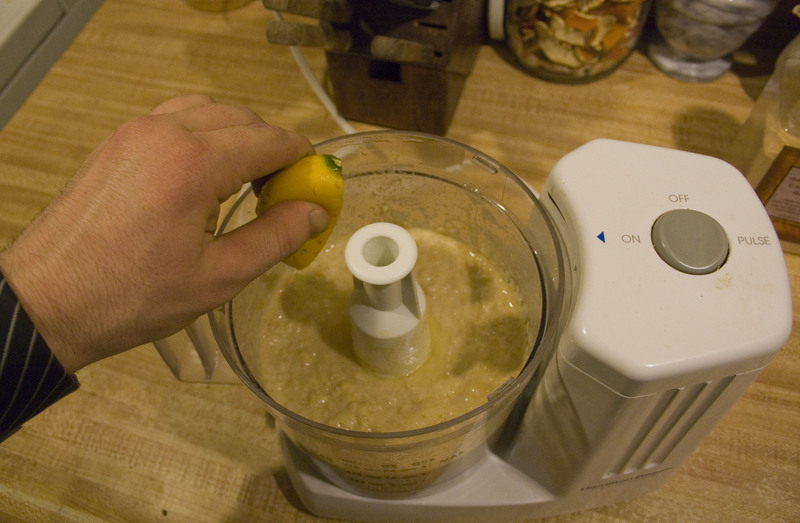 Step 3: Add you lemon juice, make sure to get the seeds out or you will have crunchy hummus. I usually use a full lemon, the citric acid and salt are your only preservatives. 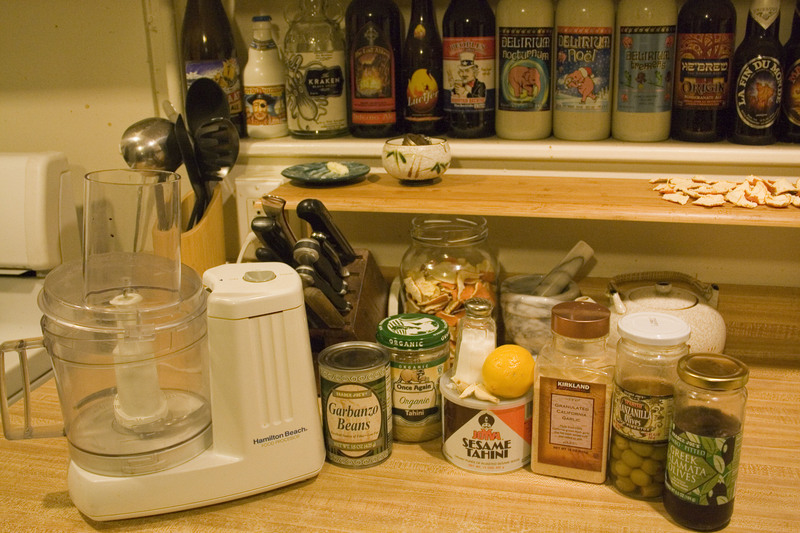 Fresh hummus keeps about a week in a fridge, maybe more if you load up on salt/lemon. Step 4: Add your garlic. I use fresh minced garlic as well as powdered garlic…seriously, I love garlic in a bad way. Step 5: Now for optional add ins like pine nuts and olives. My hummus usually had both in it as well as a bouquet of spices. Finished hummus should look something like this, with a nice creamy consistency. Some people like chunky hummus, if you are one of them do the same as above but with less blending (only blend at the very end of the process). I didn’t think about making it dry for instant hummus, that’s really handy to know. I’m also a fan of roast tomato in my hummus. I generally opt for chili powder over red pepper, but that works great too. I visit every day a few web pages and information sites to read articles or reviews, but this weblog presents feature based articles.